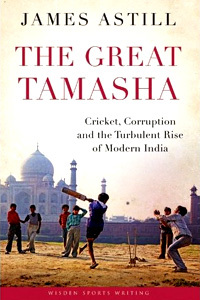 Tamasha is a Hindi word meaning entertainment and, in this enthralling book, political editor of The Economist, James Astill, describes, amongst other subjects, how the IPL plays its grand part in what is currently a boom time for India’s economy. Pardon the probable misuse of the word but, if Indians see the spectacle of the IPL – if not always for the quality of the cricket – as their tamasha, devotees of Indian cricket and India’s rise to global prominence should also see this book as a great tamasha. It is tremendously informative and entertaining and Astill makes what, to many people, might be a fairly complex subject into an eminently readable and fascinating book. An awful lot of research has gone into producing this book and has involved interviewing a lot of different people. From the now exiled creator of the IPL, Lalit Modi, to a low-caste youngster who was, in his own way, cheerful despite the snubs associated with his caste, Astill portrays what is like for a vast number of people to be part of a successful India. Amongst his interviewees are the father of up-and-coming Cheteshwar – or Chintu – Pujara, owners of the IPL franchises including Vijay Mallya and Preity Zinta, people who have excelled in more modest occupations and come good in slum areas. Astill shows the good impact India’s boom has had on people and the hopes that they nurture for the future. Having worked in India, spent a lot of time there and being married to an Indian lady as well as having a tremendous and thorough understanding of India’s economy through his position at The Economist, James Astill is in the perfect position of telling readers not only about Indian cricket history but also about their rise as a global power. He does it supremely well. James is also related to an England player who played in India in the 1930s. I had recognised the name – and his name – and wondered about this possibility and, initially, I also thought that, well, he was rather proud of the fact! On my personal note, I first went to India in 1986 before the boom and remember seeing Morris Oxfords plying Madras’s – yes, it was still called that then – Mount Road or Anna Salai and the odd newer car made quite an impression. These days, there are few if any Morris Oxfords – my cousins owned one until recently – and the roads are deluged with the latest models, shopping malls abound and India is a far more confident place than it was when I first visited. I have no chance of being able to articulate what James Astill has done in The Great Tamasha and I found it a most unforgettable and tremendous read. It also made me feel quite good that some of the people he mentions are known to me from a Mumbai book-seller, Theo Braganza, to a DDCA committee member, C.K.Khanna, and and Sachin Tendulkar’s sidekick, Vinod Kambli, with whom I got on very well on one of his visits to the UK. What makes this book so enticing is the vast number of differently cultured and positioned people that James has interviewed. It gives a wide-ranging view of what modern India is about. The IPL may, on many occasions, be a great tamasha but the influence of the crowd must surely have an effect on our television screens – and, just a couple of generations ago, there weren’t that many sets in India and many were in black and white and fuzzy: I’ve seen them – and it shows how India has changed so dramatically. The book covers many aspects of Indian society from the caste system – which includes the rise to prominence of a cricketer from the “untouchable” caste, Baloo Palwankar – to the differences between Hindus and Muslims, relations between India and Pakistan, the advent of television – possibly one of the greatest effects on the population and one reason why cricket is so popular – as well as match fixing, marriages and politics, both governmental and within the BCCI. The BCCI is extensively chronicled as well as other cricket associations and what goes on as well as what shouldn’t go on. The greatest compliment that I can pay this book is that I found it very hard to put down. As it is not just about cricket, it shows how India has changed over the last century or so and, through his use of interviews, James Astill has put together a brilliant description of this remarkable country and its people. I admit to still having a fascination about India after thirty-six visits over twenty seven years but the curiosity is still there and The Great Tamasha will, I am sure, appeal to anyone interested in this fascinating country.